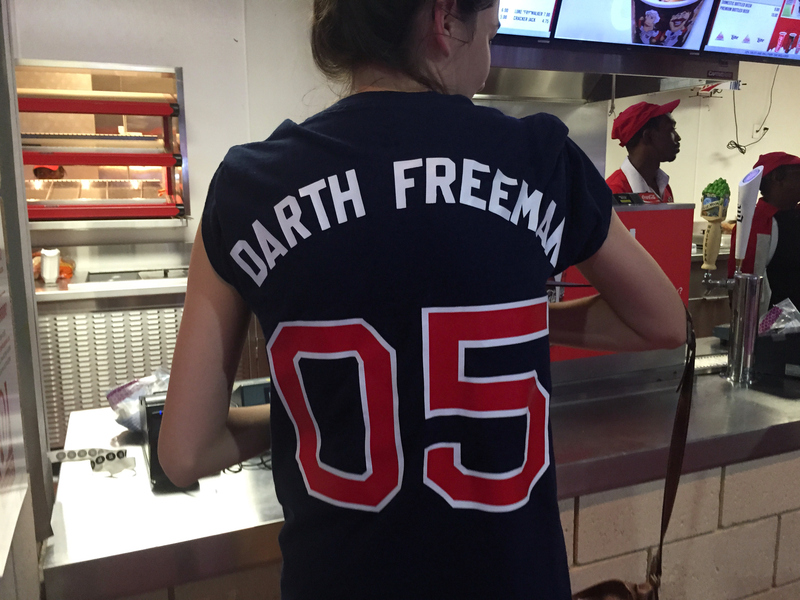 Star Wars Day | Let Teddy Win! 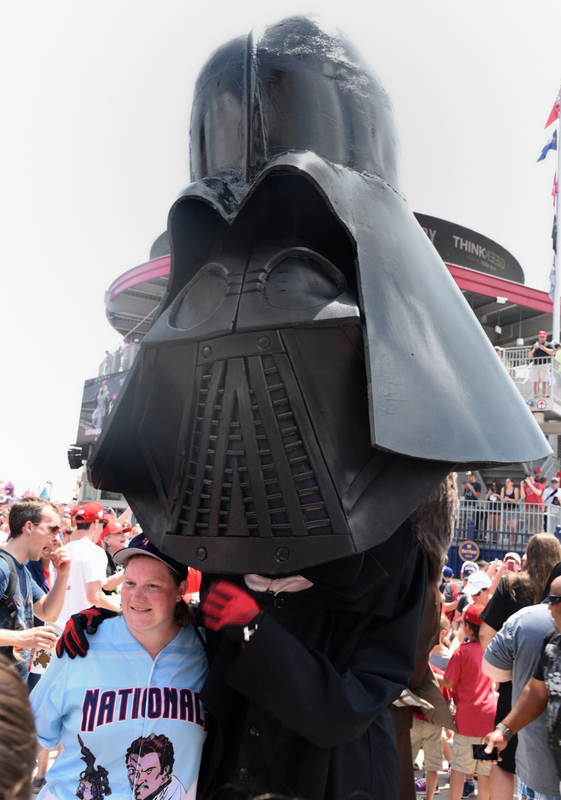 Saturday was Star Wars Day at Nationals Park, and after just three seasons, a couple of traditions have clearly been established: the fourth inning presidents race will end in an epic lightsaber battle, and Thomas Jefferson will be in drag. 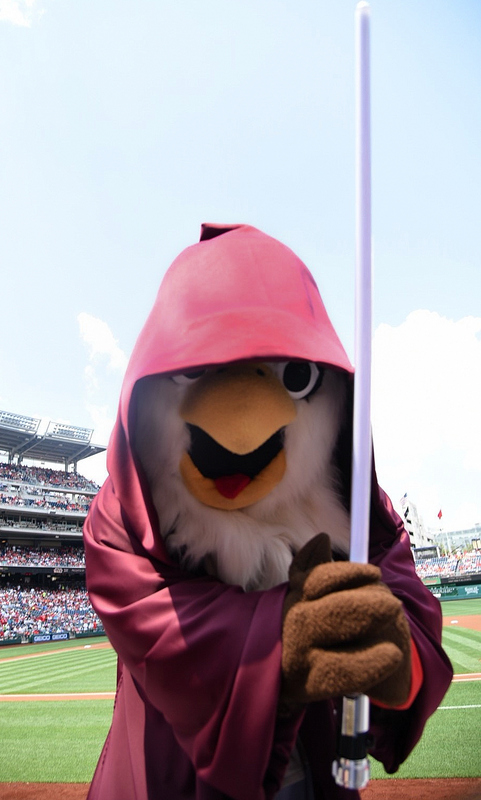 Teddy Roosevelt (Chewbacca) and Abe Lincoln (Finn) jumped out to an early lead before being clotheslined by Jabba the Hut, who had emerged from the Nats’ bullpen. Thomas Jefferson, who had dressed as Princess Leia the previous two years, passed them both in a Rey costume, before running into George Washington (Kylo Ren). Jedi master Screech leaped onto the field to hand a lightsaber to Rey, who used the force to disarm Ren in the ensuing battle. 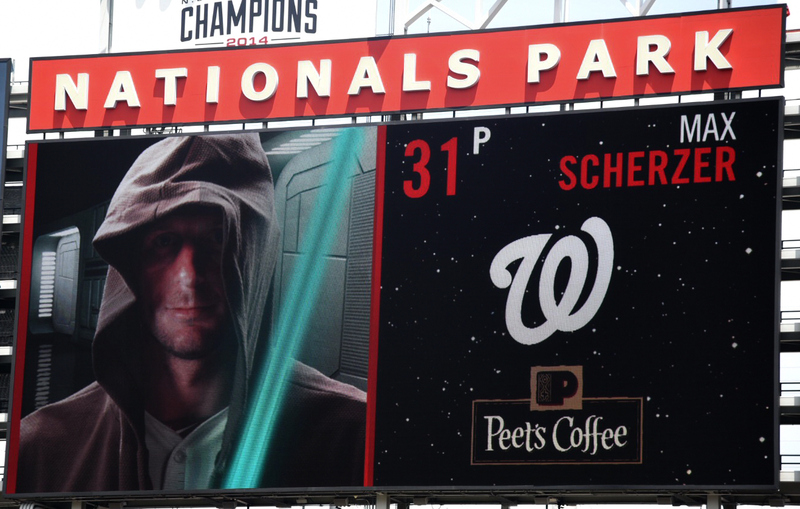 Meanwhile, another year has gone by without the Nats heeding Han Solo’s advice to let the wookie win. 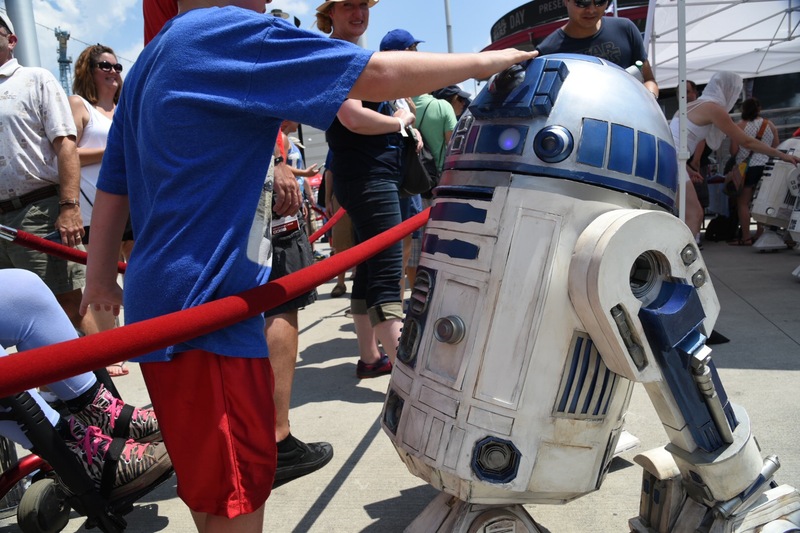 Temperatures hovered around 100 degrees Saturday night, but that didn’t stop a sellout crowd from joining in the fun on the second annual Star Wars Day at Nationals Park. 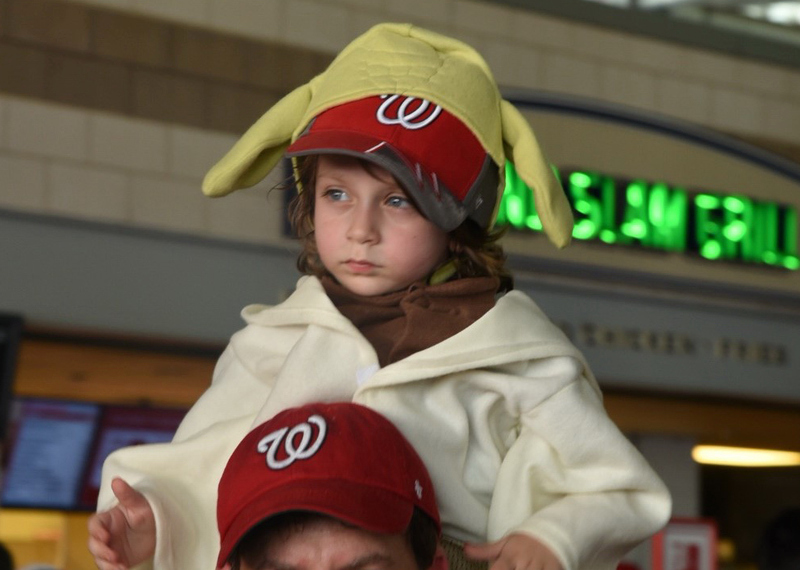 Star Wars themed organ music and graphics punctuated the night, costumed fans were featured on Nats HD, and dozens of costumed characters roamed the concourse, adding to the fun. 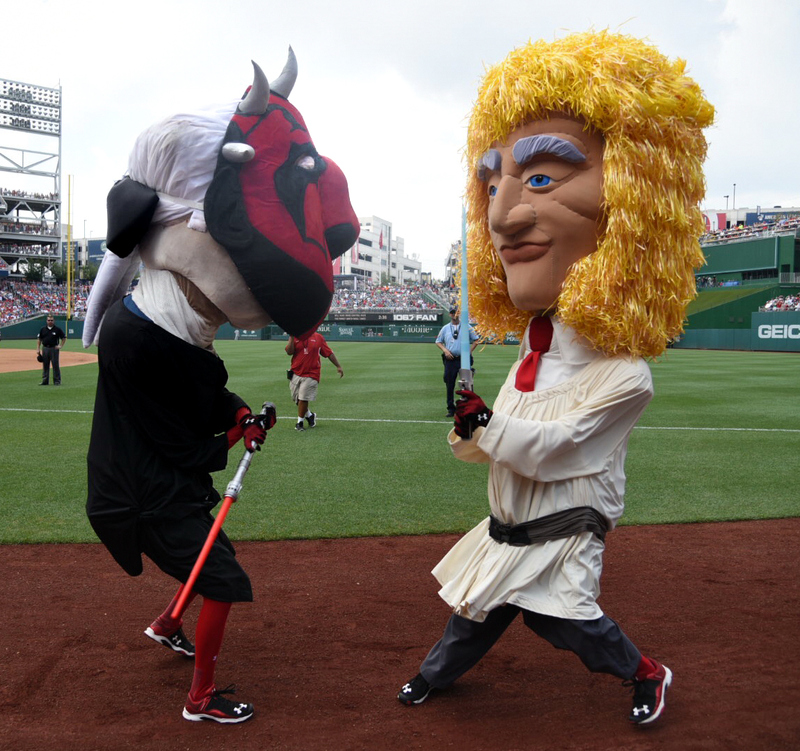 In the fourth inning presidents race, the rebel alliance finally beat the dark side in an epic presidents race battle, but the mascot team once again forgot the golden rule to always let the wookie win. 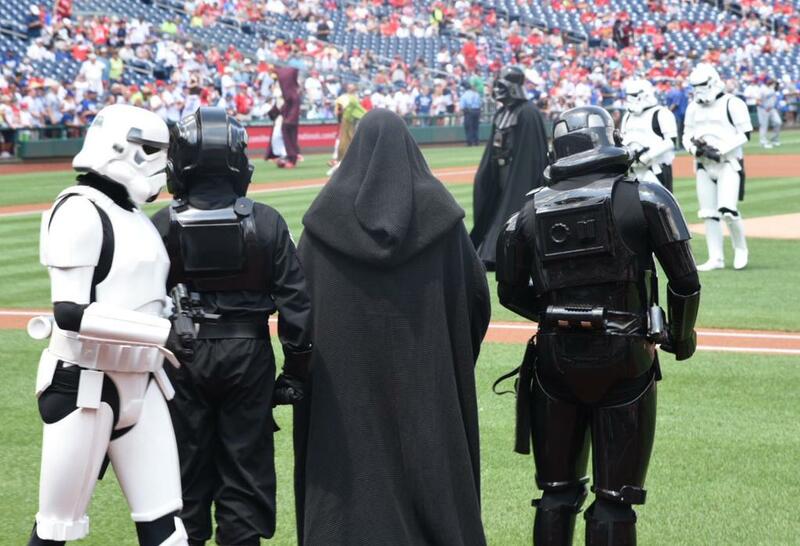 Presidents George Washington and William Howard Taft set up along the first base line dressed as Kylo Ren and Captain Phasma, determined not to let anybody from the rebel alliance get through. 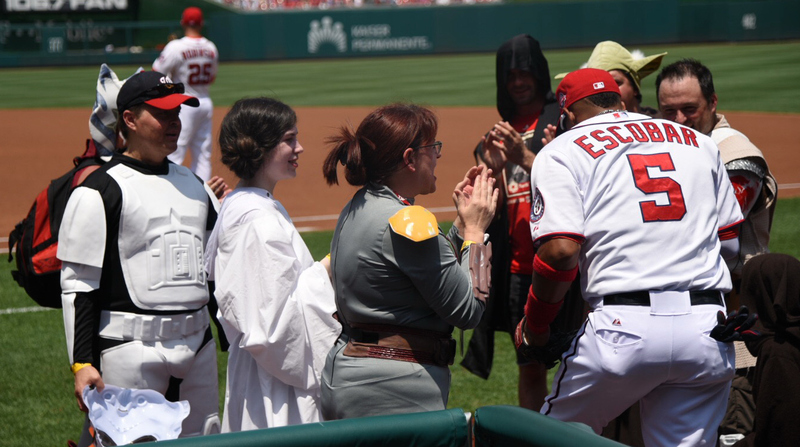 Teddy Roosevelt (Chewbacca), Abe Lincoln (Rey), Thomas Jefferson (Fin), and Herbert Hoover (Poe Dameron) charged forward from the outfield, where they scuffled with Taft (Phasma). After three presidents went down, Jefferson (Fin) and Lincoln (Rey) took turns taking on Washington (Ren) in a light saber battle for the finish. 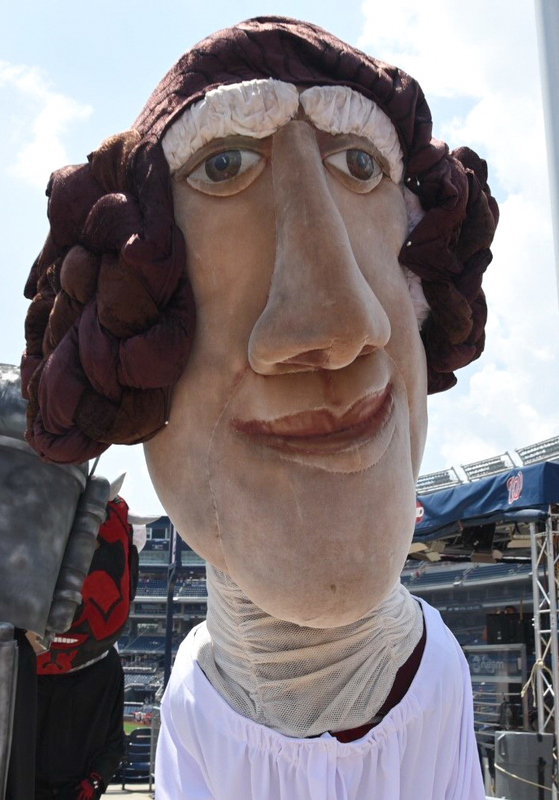 Washington Post intern Lauren Loftus has published a wonderful behind-the-scenes profile of the genius behind the customized racing presidents costumes from Sunday’s Star Wars Day promotion at Nationals Park. 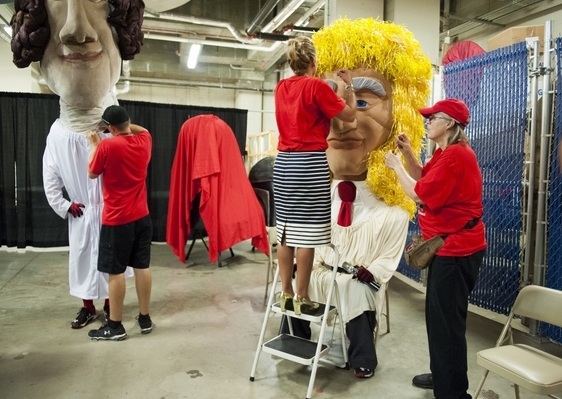 Longtime readers know that the Nationals’ racing presidents were built by Randy Carfagno Productions in New York City, but when Star Wars costumes, wigs, astronaut helmets, or other repairs or embellishments are called for, who do the Nationals call on? 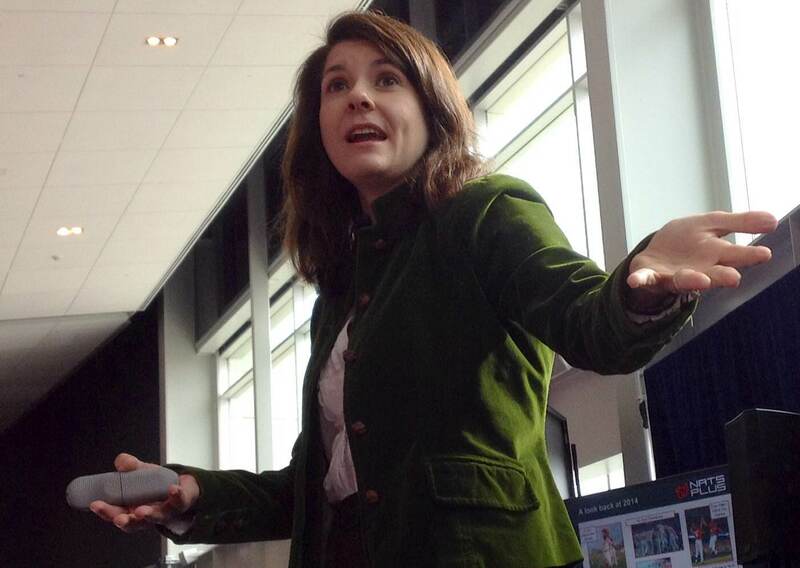 DC-area parents are no doubt familiar with the work of Ingrid Crepeau, longtime puppeteer behind the children’s shows produced by Silver Spring-based Dino Rock Productions. 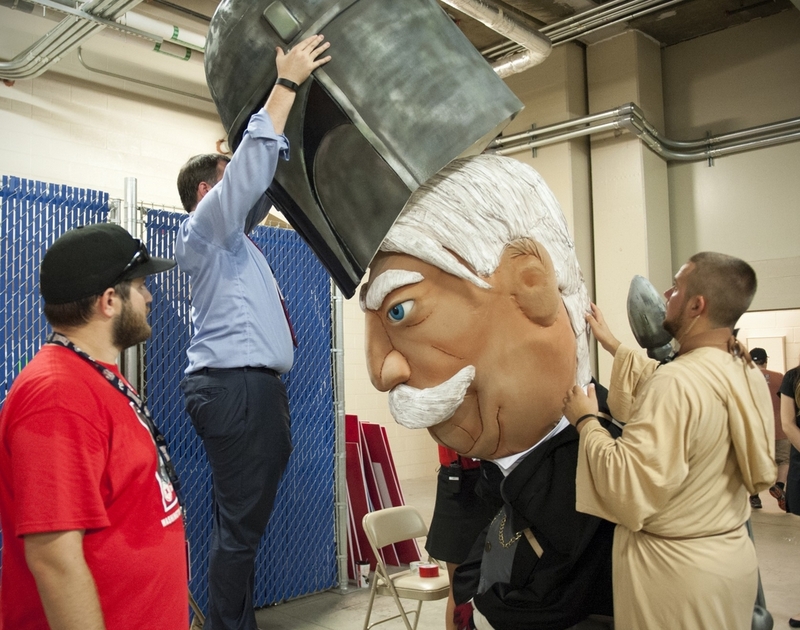 Loftus’s piece explains how Crepeau has in recent years built a successful side business building, repairing, and costuming local sports mascots. Crepeau tells the Post she’s been working on the presidents for six years, which makes a lot of sense. 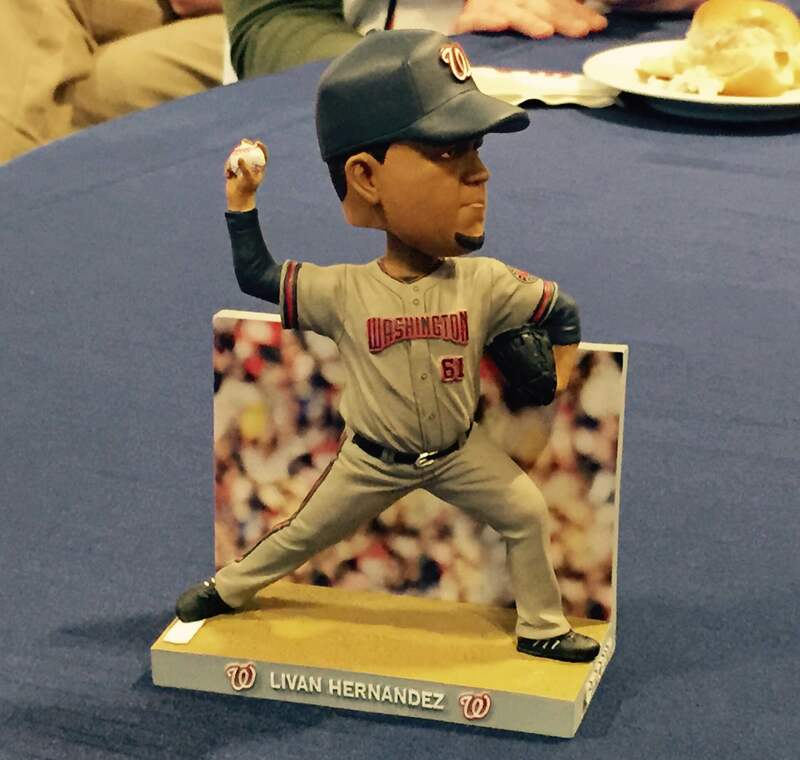 It was six years ago that Teddy missed several races when his costume frame cracked, an incident that the Post at the time called a “classic Washington cover-up.” On several other occasions, Teddy’s glasses have been damaged. 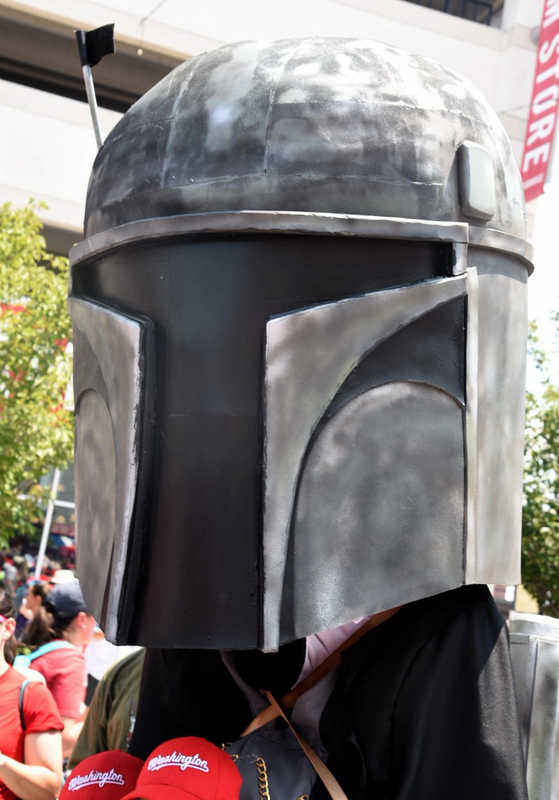 With Crepeau on board, there’s no longer a need to send costumes to New York for repairs. 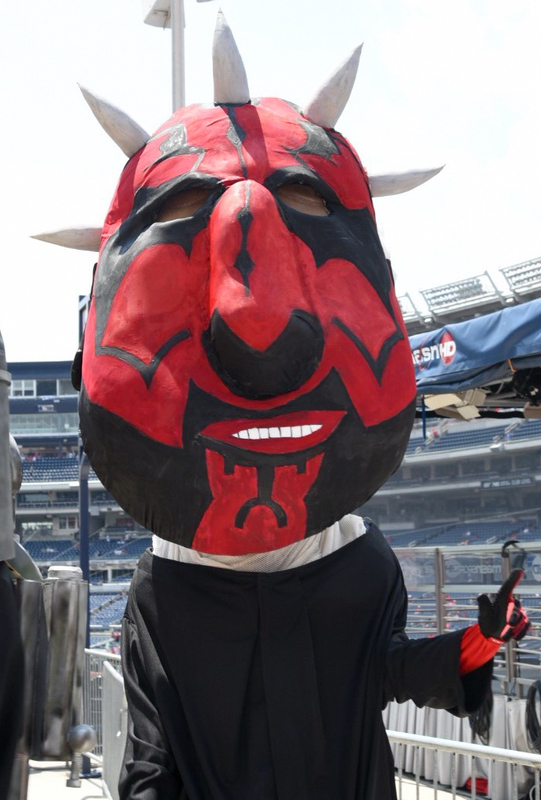 Sunday was the first Star Wars Day at Nationals Park. 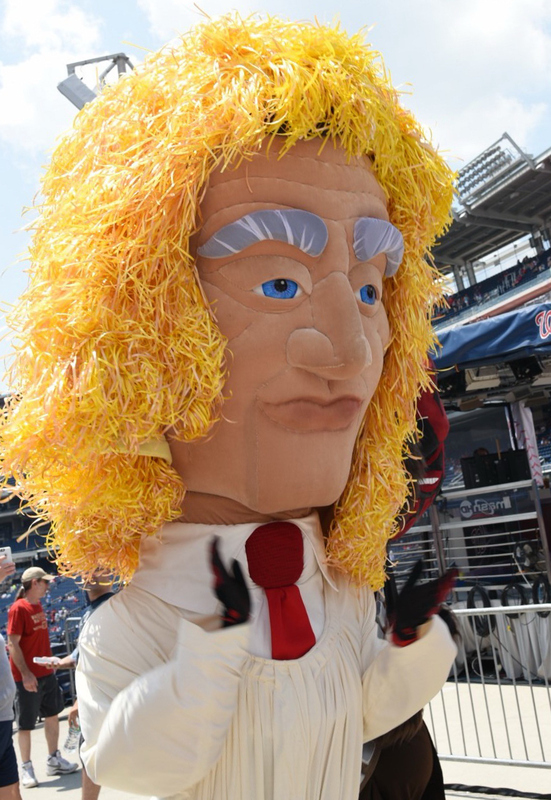 The Nats transformed every aspect of the fan experience into an intergalactic voyage, but the hit of the day by far was the Nationals’ racing presidents, who dressed as characters from the movies and were swarmed by the sellout crowd wherever they went. 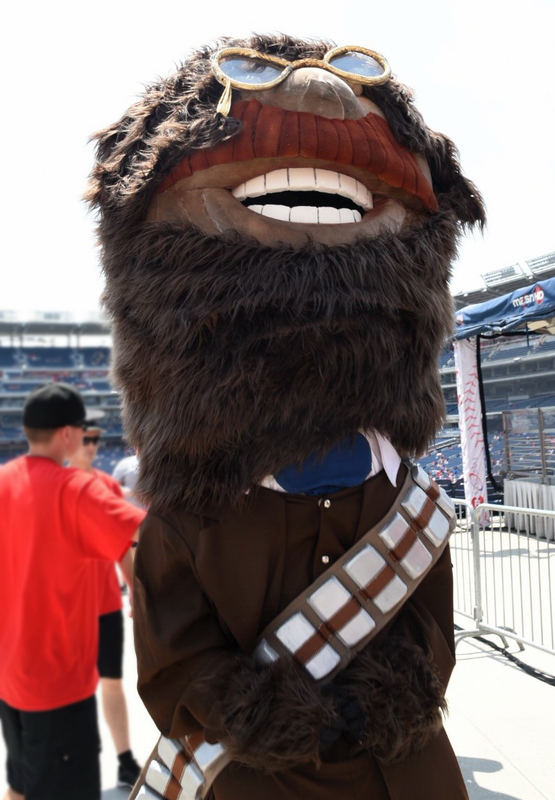 Despite the brutally hot weather and the 5-0 beating that the team took at the hands of the Los Angeles Dodgers, it’s fair to say that the promotion was a resounding success, though when it came to the 4th-inning presidents race, the Nats forgot two important rules: the good guys always prevail, and you always let the wookie win. 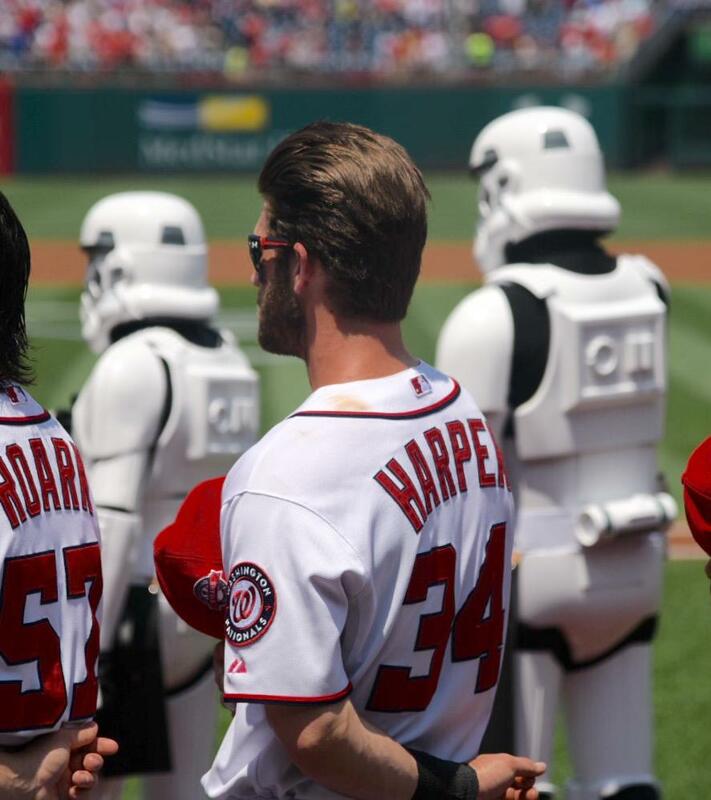 More on that in a moment, but since a picture is worth a thousand words, here without further ado is our photo compendium of the Nats Star Wars Day. The costumes certainly didn’t stop with the racing presidents. 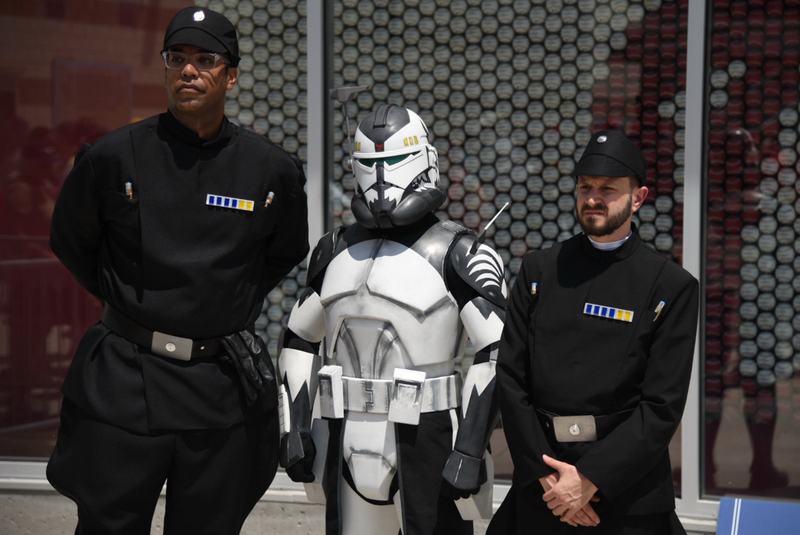 Actors posing as Luke, Han, Leia and all of your favorite characters were stationed throughout Nationals Park to pose for photos with fans, but the most overwhelming presence was that of the evil empire, which stationed stormtroopers, imperial guards and officers both on and off the field. Fans got creative in ways too numerous to mention, and several were selected to go on the field and help introduce the players. 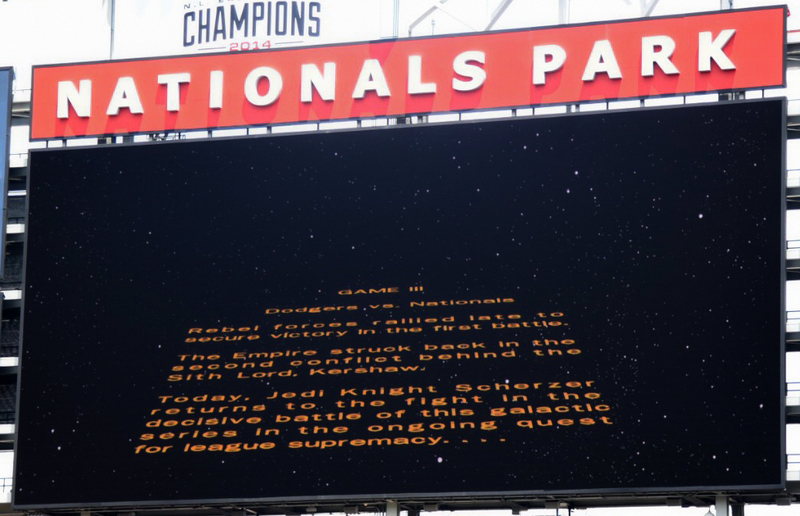 On Nats HD, PA announcer Jerome Hruska used a voice filter to sound more like Yoda, and introduced the epic battle to come in classic Star Wars fashion. 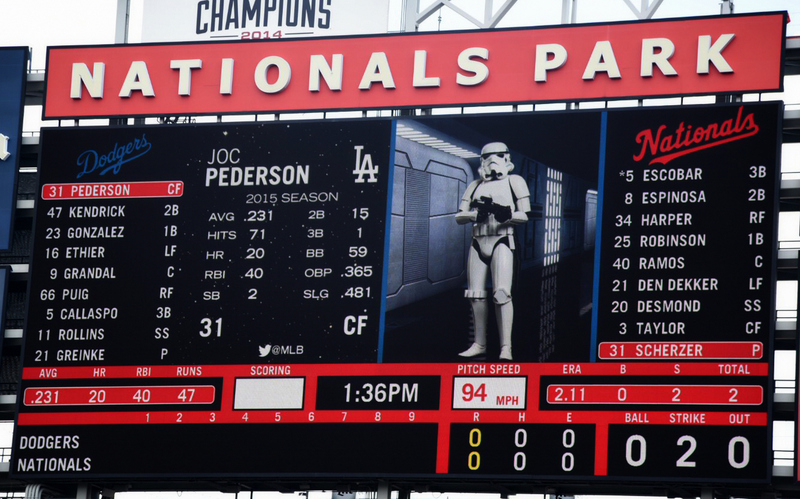 When it came time to introduce the players, every Dodger was represented as an imperial stormtrooper, while every member of the Nationals was given the hero treatment. 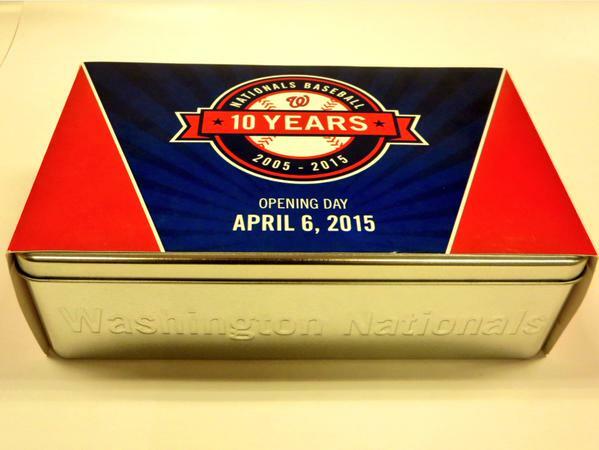 Finally, there was that matter of the presidents race. 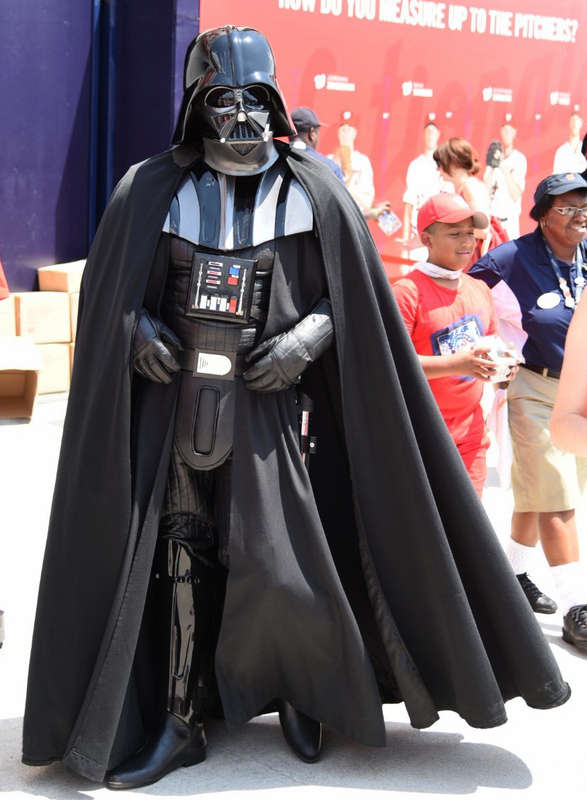 The fourth inning ritual started with the famous Star Wars Cantina music, and then pitted the galactic empire against the rebel alliance as Darth Vader (Abe Lincoln), Boba Fett (William Howard Taft), and Darth Maul (George Washington) took on Princess Leia (Thomas Jefferson), Chewbacca (Teddy Roosevelt), and Luke Skywalker (Calvin Coolidge) in a relay race. Teddy (Chewbacca) handed Coolidge (Skywalker) a big lead in the anchor leg, but George (Darth Maul) passed Cal and engaged him in a light saber battle on the first base line. Cal lost his light saber, George took the win, and in keeping with what transpired on the field, the evil empire prevailed.